A new contest aims to reveal the most science-friendly president. 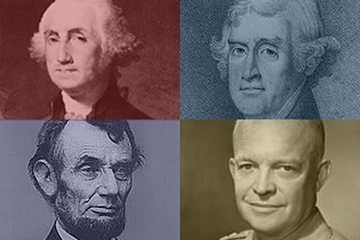 Shown here, George Washington, Thomas, Jefferson, Abraham Lincoln and Dwight Eisenhower. Which U.S. president was most science-friendly? A new contest by the Union of Concerned Scientists (UCS) pits Lincoln against Eisenhower and Kennedy against Nixon in a match-up just in time for President’s Day (Feb. 17). The goal of the contest is to highlight science in the presidents’ careers, “whether it’s Jefferson commissioning the Lewis and Clark expedition, Theodore Roosevelt pushing for the Pure Food and Drug Act, or George H.W. Bush launching new Earth observation programs,” said Aaron Huertas, a spokesman for the UCS, a nonprofit organization that promotes science in the public sphere.